Last year, we teamed up with Weston Playhouse Theater Company to produce a short video tour of the brand new Walker Farm facility. The video featured an interview with Steve Stettler, the longtime Artistic Producing Director, who retired at the end of the Playhouse's last season. The video received recognition from the Northeastern region of the Alliance for Community Media, the trade association for community TV stations & media organizations, at its annual “Nor’easter Awards” in November. It earned 2nd place in the “PSA / Short Program” category. 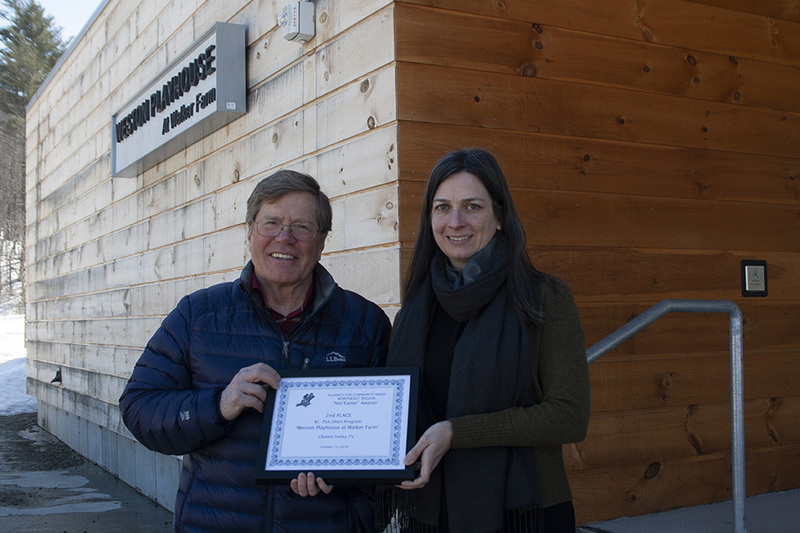 Shown here with the award are our Board President & Treasurer, Fra DeVine (who is also on the Board at Weston) and Susanna Gellert, the new Executive Artistic Director at Weston Playhouse Theater Company. Last week, we went back to Walker Farm to record a follow-up to that earlier video. Fra interviewed Susanna, covering a variety of topics: how the Walker Farm facility is being used, Susanna’s background and vision, and a preview of the plays she is bringing to the Playhouse during the upcoming season. The new video is also featured on our website here and will be running over the coming weeks on our community access channel. We are grateful for the community partnerships we have with organizations such as Weston Playhouse!